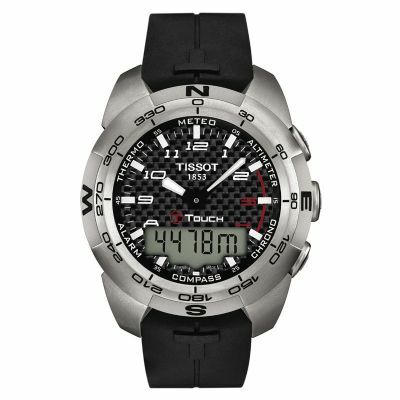 This mens Tissot T-touch Expert model is a striking design in titanium and leather. Features include black dial, chronograph and high-visibility markers, and the watch fastens with a brown leather buckle strap. I have been looking for a smart watch for a long time, years in fact. I wanted a watch which would not only look the part but would be usable everyday. The Tissot T-Touch Expert does everything I want and more. The brown leather strap and clasp is very comfortable. The size of the watch is not to obvious and looks good with my uniform or casual clothing. The face of the watch is just the right size and the numbers are easy to read. The functions on this watch are usable and the face its self, tactile. If i am going for a run or out to dinner, this is the perfect partner. I never leave home without it! 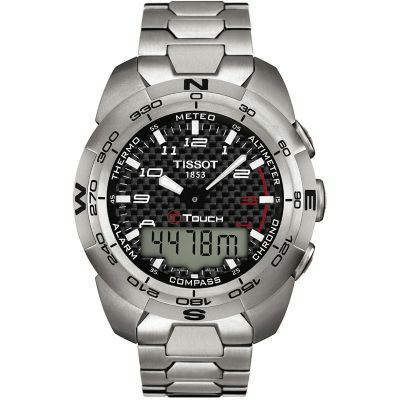 The Tissot Touch Expert is a amazing watch and was just as described on the websites description. The delivery was fast and on time. They even bettered a price that I found on another website. All in all a very good experience shopping at watchshop. I will definitely buy my next watch from them. So far a lovely watch. All the functions work as described. I bought it to a Suunto outdoors watch (the third one to break) so I had an attractive watch that was outdoor practical at any time. I think it looks lovely and very smart. Its big but not large - and very light. The only downside I have to the watch is the hands are not as bright as they could be at night - but you have the light of course. When they start using the technology that Luminox uses it will be ideal. I will be changing the strap for something simpler as I find it a bit fiddly and slightly short. All in all a very smart, very functional watch. Was not expecting to have such a good deal in the UK. ... and I have to say it lives up to it 200 percent! The watch and I have been inseparable for the last 48 hours. It has been on my wrist throughout - and the gadget freak that I am - has been subjected to a full test of almost all its functions. So, let's get to the meat here. The watch is a two-zone time keeper, which was a huge requirement for me since I keep shuttling between London and NY. The analog time can remain set to my home city and the T2 can be displayed in the digi-display so I know what time it is in the local city while remembering to wish the wife good night on time - after all, she got it for me! The second time zone can be set with 15-minute increment/decrement which is convenient since some time-zones in the world have intra-hour differences. Next, the uber-cool weather feature. It snowed a lot this week in London and the rest of UK, and on Sat night (the day the watch arrived in the morning) we were wondering whether to go out - the watch indicated only a slight chance of deterioration of weather, so we went out, and it was good that we did. No more relying on crappy tv-station weather forecast. I have my personal weather station wherever I am. I cannot wait for the ski season to use the Altimeter to log the number of vertical miles done. A read of the features here is that the watch logs vertical altitude differences once you put it in that mode. The compass is useful, although it's quite sensitive to the angle to horizontal you are holding the watch to - but I guess that is a general compass issue. The bezel can be moved to align with N and 5-deg increments read off the bezel. The watch is water-resistant to 100 metres. Will wait to test that while snorkelling in 3 weeks. The manual indicates that the watch can also withstand scuba - if no more than 100m. The Chronograph function has two features - a stopwatch and a countdown timer. Stopwatch can do split/lap times as well. I won't mention the Alarm and date since those features are there even in the most basic chronograph watches. Options give you the ability to choose units for various functions - metres/feet, Celsius/Fahrenheit, 24h/12h, and a cool setting of the hemisphere and type of region for more precise meteorological assessment! I saved the best for last - I mentioned the watch has been on my wrist for 48 hours? That's because with a comfortable (and light) leather strap, the Titanium shell keeps this watch unnoticeably light! So, if you are looking to get a Tissot T-Touch, do go for the Titanium ones, else, with all the functionality, the Steel ones could get pretty heavy on the wrist. Great watch, great service. One problem - advertised as black strap and it has a brown strap - not a major problem but might be for some. Watch is incredibly light and all features work perfectly.